Posted on September 29, 2014	by Platanos, Mangoes and Me! I am here visiting my cousin Patty and her daughter Kristin in Raleigh, North Carolina. 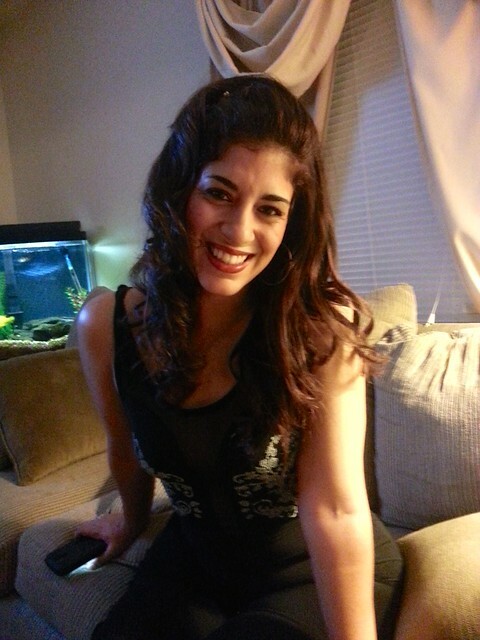 Kristin is a beautiful girl that when I am with her she fills my life with joy and anyone that meets her feels the same. 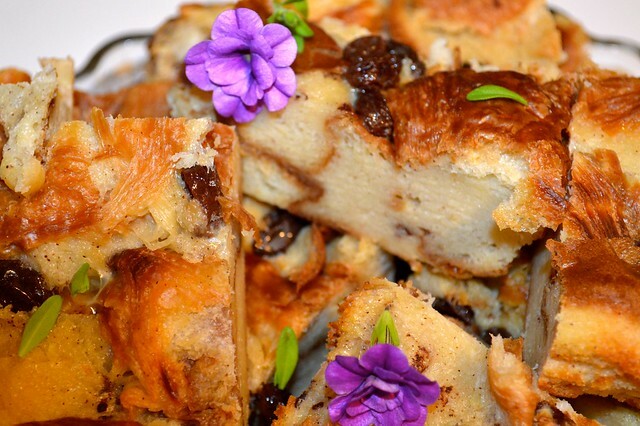 When she asked for bread pudding, her wish was immediately granted. Bread pudding is a big deal in our family and mother’s was always the best. This is my first time using croissants and I must say that I like this version better than using day old bread. The croissant’s are buttery and flaky and you can taste the difference in the finished product. 2 cans evaporated milk – 12 oz. 1 can of milk (using evaporated can as measure) – 12 oz. 1 can condensed milk – 14 oz. Break up croissants with your hand in one inch pieces and place in a well buttered baking sheet. Add raisins and mix. In a blender, blend all other ingredients including butter. Pour over the croissant pieces and press so that bread will soak up and let it sit for about 1/2 hour. Preheat oven to 350 degrees and bake until pudding is golden brown. The electric oven I used took only about 1/2 and hour. Note: The bread pudding lasted 2 days. This entry was posted in Breakfast/Brunch, Latin Traditional, Puerto Rican - Tipico and tagged Bread, Dessert, Raisins. Bookmark the permalink. Yes, she is beautiful and so is that bread pudding!! Norma, each time you have you of the more ‘traditional’ PR dishes, my mouth waters, my heart swells and my eyes tear up. So many great memories making “pu-di’n” with my mom. We saved whatever, if any, pan de mantequilla in the fridge until stale. I shredded while mom prepared the milk/custard. While I don’t recall the different mills used, I do remember fondly the aroma in the kitchen which was so heavenly while it would bake in the oven. This (and Arroz con Dule) were a special request by me for my summer birthday, as I could never wait till las Navidades to enjoy it. Thanks for the memories! You are always so sweet Aida…next arroz con dulce. If can remember how Mami made it. It was so good. 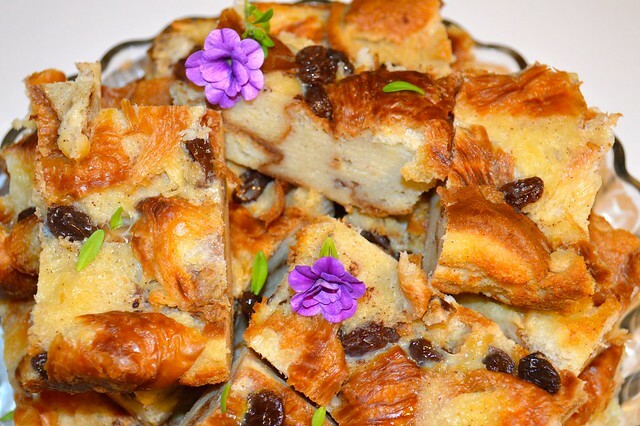 Oh, bread pudding, this is so home made…I love it…and yours look fantastic. Another delicious looking recipe Norma. 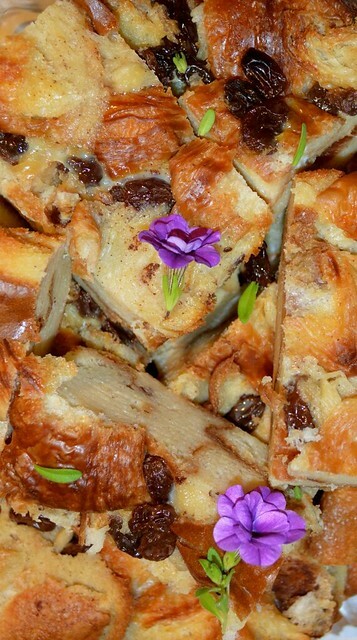 When it’s cold out, I would much rather have a nice warm bread pudding than a savory meal, lol! Can’t wait to try it out. Saludos! What a beautiful young woman–and what a terrific version of a Southern staple. Siempre me han encantado los bread puddings y este hecho de croissants debe estar glorioso, y además tiene una pinta estupenda…besos.